This is Dorothy Dandridge. Born November 9, 1922, she was a singer and actress in the '30's, 40's, 50's and 60's, until her untimely death in 1965 at the age of 42. Ms. Dandridge was a trailblazer. She was involved in the early soundies in the '40's, and her lovely face and exceptional voice distinguished her as a sought after nightclub act and actress. Her most famous role was in the musical movie Carmen Jones, where she played the title role. Her performance earned her an Academy Award nomination, only the third African-American in history to receive a nomination. 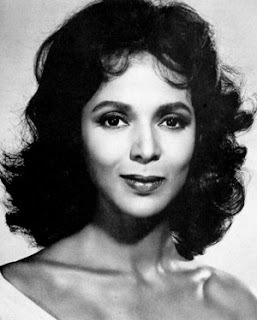 Ms. Dandridge's legacy in the entertainment industry is now well established, thanks in part to those she inspired, including Cicely Tyson, Jada Pinkett Smith, Halle Barry, Janet Jackson, Whitney Houston, Angela Bassett and others. Truly a remarkable talent, and a trailblazer worthy of the label "ill-behaved." Here's a sample of her 1940's work, a "soundy" of the song Cow Cow Boogie.